The Kings win on the road. Cherish it. This damn division has PK Subban, Patrice Bergeron, AND Erik Karlsson. That's love. Kings at Senators: Canada Sweep! Who else laughed when they showed outdoor shots of Canada while sitting pretty and drinking iced coffee in sunny CA? 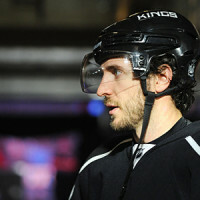 The Kings need to hit the Senators while they're hurting. Quick's goalie gaffe feels like it was forever ago, but guess what? It's only been a few days.